SF 61B - Engineered for all day wireless performance! Small enough to stow in a pocket, the SF61B healthcare scanner travels with the worker and can be quickly accessed or securely tucked away when unencumbered use of both hands is required. Despite its small size, the SF61B offers performance typical of full-size scanners, in a unique and disinfectant-ready enclosure. The compact size makes it ideal for today’s busy healthcare environment, where complete freedom of movement is essential and occasional scanning is required. The SF61B easily integrates with Bluetooth wireless to pair with iOS, Android and Windows Mobile smartphones and tablets. 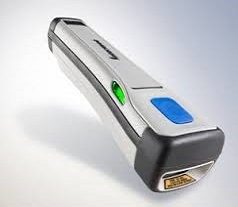 It uses a laser-free design that provides this high performance scanning capability without the risk of eye injury. The SF61B is also highly customizable to complement your healthcare environment. With the free EasySet™ PC programming tool, you can adjust LED color, security settings, beeper volume, and even enable haptic feedback (vibration profiles) for quiet hospital settings where audible tones are not desired.